Click here for audio accompaniment, because why not? Star Trek: The Next Generation enjoyed a successful, seven-season lifespan that regularly defied a lot of expectations. The original series only lasted for three seasons back in the late 1960s, and Star Trek: Phase II floundered in 1977; while the subsequent big-screen adventures of Kirk and his crew proved hugely successful (and the original series did quite well in syndication), this ambitious small-screen follow-up was still seen as a pretty big risk in 1987. 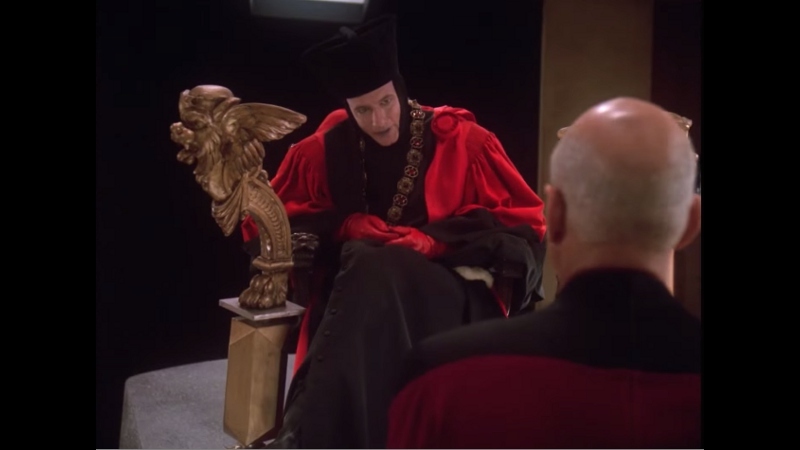 Even so, the gamble paid off: despite an unsteady first two seasons, The Next Generation proved successful enough to continue its mission for a much stronger third season...and when "The Best of Both Worlds, Part I" capped off that stellar year episodes, TNG cemented its legacy by stepping out of the original series' shadow and ran for another four seasons. The show's mixture of compelling sci-fi stories, great characters and performances, terrific special effects, and an ambitious atmosphere worked well back then and still holds up today, more than 25 years after TNG originally premiered. TNG's feature-length series finale, All Good Things..., originally aired on May 23, 1994 and capped off the series in style. Written by Brannon Braga and Ronald D. Moore while they also penned the script for 1994's Generations (TNG's first big-screen outing) with Rick Berman, the production was directed by Trek veteran Winrich Kolbe. Our story follows Captain Picard as he suffers from time displacement: almost at random, he switches between his time in the present (that is, the events of season seven), his arrival and first mission with the Enterprise crew, and 25 years in the future after a long and successful career. He soon becomes aware of his situation in the other two time periods, but there's one event that links all three: a spatial anomaly in the Neutral Zone that, oddly enough, seems to grow backwards in time. It's rare that any small-screen production actually feels like it belongs on the big screen---especially considering this aired 20 years ago, of course---but I'd put All Good Things... up against just about any Trek big-screen outing, including First Contact, The Wrath of Khan, and The Undiscovered Country. It's just got a fantastic premise that unfolds nicely as the story progresses, and the participation of Q (John De Lancie) just makes it that much better. Almost every element works in tandem to summarize, enhance, and bring almost the entire series full-circle by the closing credits. The only thing that's continued to bug me about All Good Things... is the way it's slightly rushed during the last 20 minutes, which I'd imagine is partially due to having a time limit roughly the length of two standard-sized episodes. But this production survives just about every logical criticism you can throw at it, at least enough to make it one of the most potent, self-aware, and satisfying TV finales of the last few decades...and it couldn't have happened to a better show. All Good Things... can also be found on the last disc of the recently-released Season Seven...and it's here where I'd imagine that die-hard fans will have a problem with this stand-alone disc. Though it includes a handful of exclusive extras and obviously serves up a similarly perfect A/V presentation, the format of this uninterrupted 93-minute episode is the same on both releases. I wasn't expecting otherwise, of course, but that gives casual fans one less reason to pick up this single-disc release...although I'd imagine that anyone who's collected the whole TNG run on Blu-ray thus far won't grumble too much about an extra $15. Either way, the additional bonus features are definitely worthwhile. Beginning with the release of Season Five, CBS has handled the remainder of TNG's restoration in-house and, once again, the end results are spectacular. 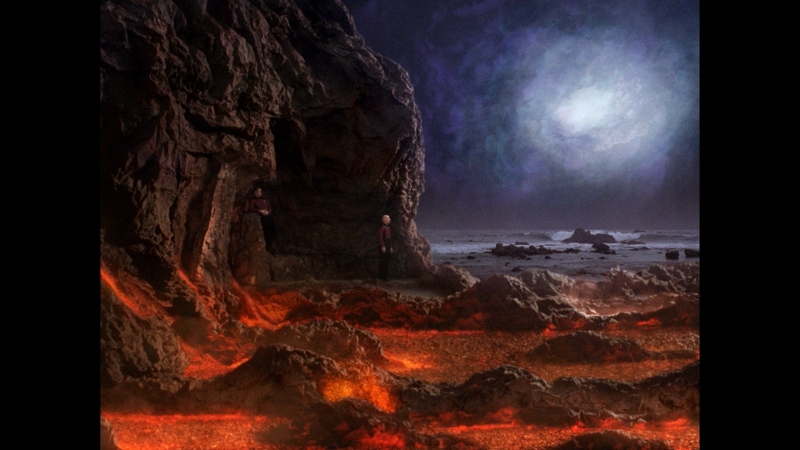 Later seasons originally made use of now-dated CGI and, though good for its time, some of it has since been tastefully revised to blend in with ship models and other filmed footage. Not surprisingly, the effects-free material is just as impressive and boasts excellent color timing, crisp image detail and a consistently solid grain structure. Overall, this 1.33:1, 1080p transfer of All Good Things... is virtually flawless in every conceivable way; far beyond what most of us could ever expect a few short years ago. Most fans have seen the huge leap in quality between these Blu-rays and DVD/broadcast versions, and the benefits are still evident here. Once again, this time around there's no upscaled footage to be found anywhere; this was never terribly distracting to begin with, but speaks more about the thoroughness of the restoration crew. It's easy to forget just how much time and effort has gone into rebuilding this series from the ground up; for that alone, CBS has earned another inarguable five-star rating. DISCLAIMER: The screen captures featured in this review are strictly decorative and do not represent Blu-ray's native 1080p resolution. 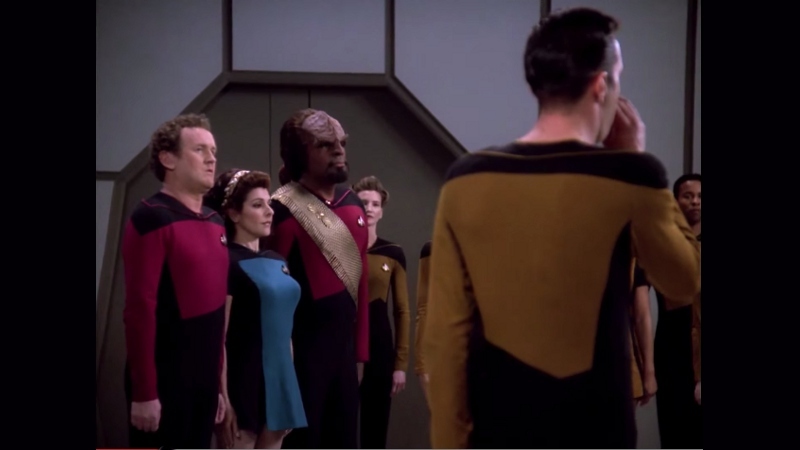 Not to be outdone, TNG's revamped audio presentation is basically flawless from every angle. As before, we're blessed with a new DTS-HD Master Audio 7.1 mix; the added punch mostly beefs up music cues and warp fly-bys, but it also creates a pleasing ambiance for interior scenes as well. Dialogue is crisp and clear, LFE is notable at times and Dennis McCarthy's score never fights for attention. The original 2.0 Stereo Surround mix has also been included for purists, but it's still presented in lossy Dolby Digital instead of DTS-HD Master Audio. Most fans shouldn't consider this a deal-breaker by any means, but it's definitely a curious (and continued) oversight in an otherwise detail-oriented effort. An optional Dolby Digital 2.0 dub is provided in German...as well as optional subtitles in English and German, unlike the more versatile (and region-free) TNG season collections. Not sure why they didn't use the available dubs and subs. The "LCARS" computer interface menu designs are attractive, simple and smooth, much like the old DVDs and recent Blu-ray season sets. This "film" has been divided into more than half a dozen chapter stops, though no sub-menus are present. No obvious layer changes were detected during playback and the Blu-ray is locked for Region A players only. This one-disc set is housed in a silly eco-friendly keepcase with an embossed slipcover and no inserts of any kind. Pretty much the same as other TNG stand-alone releases...and these exclusive extras will either delight or infuriate die-hard fans, depending on your perspective (and willingness to shell out another $15, of course). The main attraction is a brand new feature-length Audio Commentary with Ronald D. Moore and Brannon Braga, along with supplemental guru Roger Lay. This is a lively, informative and well-meaning track filled with plenty of interesting nuggets, from the script's quick development to the challenges of writing it alongside Generations, as well as more typical subject matter like general production, series fatigue, assembling the footage, TNG as a whole and much, much more. It's obviously worth a listen to anyone who bothers to pick up this separate disc...although of all the opportunities to gather the principal cast members together for a commentary (which sadly never happened), this was the most obvious candidate. Also here is the final Retrospective Documentary, entitled "The Unknown Possibilities of Existence: Making All Good Things..." (26 minutes), which presents separate interview footage with key cast and crew members including Ronald D. Moore, Brannon Braga, Rick Berman, Patrick Stewart, John De Lancie, Jonathan Frakes, LeVar Burton, Brent Spiner, Gates McFadden, Michael Dorn, Marina Sirtis, and more. This is an interesting little slice of history and gives an honest approximation of this episode's production, from the challenges of shooting to developing Generations. Closing things out is a collection of five Deleted Scenes (8 minutes total) and both original Episode Promos (which, from what I remember, originally aired near the top of each hour). Optional subtitles are included for everything bu the commentary. All Good Things... is a fantastic series finale for Star Trek: The Next Generation and holds up perfectly 20 years later. This feature-length adventure does a fine job of capturing everything that made the series so likable and enduring: action, adventure, mystery, humor, and a scope that rivals some of the franchise's better big-screen outings. My only mild complaint is that it wraps up a little too quickly in the last 20 minutes...but within the boundaries of the format, this is completely acceptable. CBS' stand-alone Blu-ray serves up a predictably perfect A/V presentation and some interesting exclusive supplements...but unlike their other release of this type, All Good Things... is presented in the exact same uninterrupted format as the Season Seven collection, so there's even less of an incentive than usual. I'd imagine die-hard fans will pick this up anyway, but more casual viewers should stick with a rental. Mildly Recommended.